The AVI is a commonly used file format developed by Microsoft for storing both video and audio data in a single file. The AVI file is typically less compressed than other, which means that an AVI file will be larger than the same file in one of those more compressed formats. Looking for a free AVI Converter to convert AVI to other popular file formats or convert popular file formats to AVI? The fact is that most of AVI Converter on the market only offers a free trial version with watermark printed on the converted files. Fortunately, here comes Pavtube Free Video DVD Converter Ultimate, which offers a totally free version to completed AVI conversion job on Windows 10/8/8.1/8/7. Thanks to its batch conversion mode, you can batch load multiple video files at one time to save your precious time. Apart from being used as a remarkable free AVI Converter, the program also acts as a free AVI converter, you can complete most simple editing task with its built-in editing tools such as trimming, cropping, merging separate video into one file, adding watermark, applying special effect, deinterlacing interlaced video into progressive form, insert external subtitle, etc. Moreover, if you are not satisfied with output video quality, you can flexibly adjust output profile parameters such as video codec, resolution, bit rate, frame rate, audio codec, bit rate, sample rate, channels, etc as you like to get better output video and audio quality. As a 100% free AVI Converter application, Pavtube Free Video DVD Converter Ultimate is very clean and safe. It doesn’t feature any ads or bundled adware and won’t trick you into installing adware or spyware. It is very simple to use, any one can learn to use it in minutes. What’s more, the program supports high conversion results, you can’t find any difference between the converted video and the original source video. How to Free Convert AVI without Watermark? Step 1: Load source AVI video. Download the free trial version of the program. Launch it on your computer. Click “File” menu and select “Add Video/Audio” or click the “Add Video” button on the top tool bar to import source AVI files into the program. You can load multiple AVI files into the program by clicking “Add from folder” button. Clicking the Format bar, from its drop-down list, choose one of your desired file format according to your own needs. 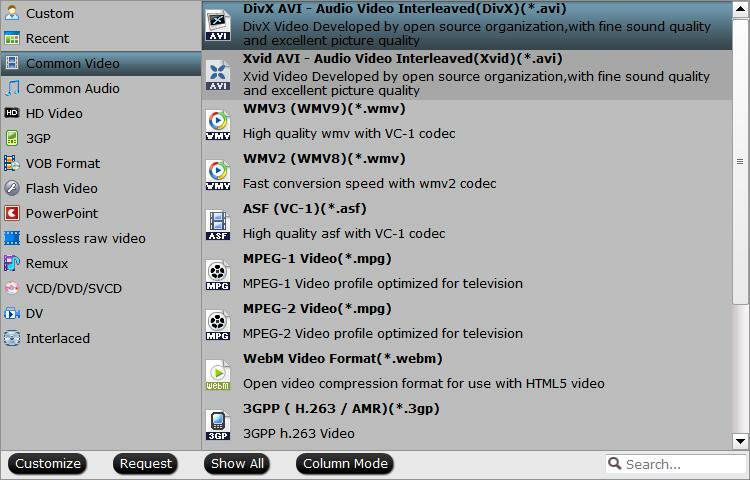 Here, you can use the program to convert other popular file formats to Divx AVI, Xvid AVI or HD AVI format. You can also choose to convert AVI to other popular file formats such as “MOV – QuickTime(*.mov)” under “Common Video” main category. Step 3: Trim/Crop/Adjust AVI output video aspect ratio. By default the Edit icon is grayed out. To activate the Edit menu, you have to select an item first. When a video or movie is selected, click the pencil like Edit icon on the left top tool bar to open the video editor window. 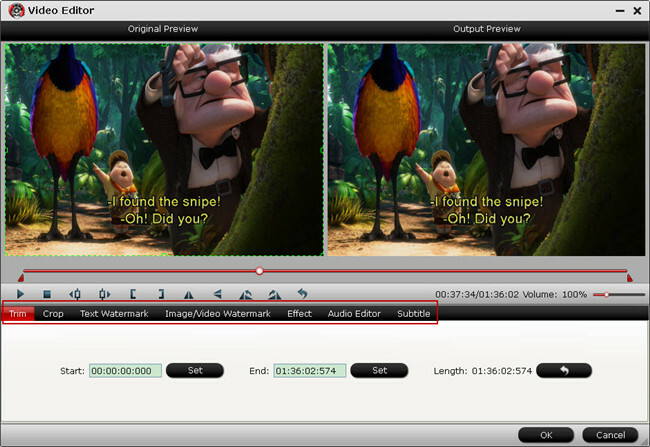 Here, you can drag pointers on the process bar or set exact time point in Start and End boxes to set to trim or cut off, crop video by dragging and dropping the crop frame or setting values, change output video aspect ratio to let it fit with your devices. After all setting is completed, hit the “Convert” button at the right bottom of the main interface to begin the AVI to video free conversion process. When the conversion is finished, click “Open Output Folder” icon on the main interface to open the folder with generated files. Then you freely get a video without watermark for convenient playback, editing or sharing as you like. Tips: For those people who wish to convert AVI to MP4 or convert AVI files on Mac, Pavtube Free Video DVD Converter Ultimate won’t satisfy you that demand. You will need to download a more advanced program called Pavtube Video Converter Ultimate, which has all the features and functions that you can find on Pavtube Free Video DVD Converter Ultimate, what distinguishes Pavtube Video Converter Ultimate from the free version is that this program allows you to output MP4 files with various different compression codec such as MPEG-4, H.264, H.265 and file resolution such as HD MPEG-4, HD H.264, HD H.265 and 4K H.264 High Profile MP4, 4K H.265 MP4. What’s more, you can also choose to output SBS/TAB/Anaglyph 3D MP4 format for viewing on 3D TV/VR Headsets/3D Projector/3D Video Players, etc. In addition, unlike the free version that is only available on Windows platform, Pavtube Video Converter Ultimate can be downloaded on either Windows or Mac platform (get Mac version). How Can I Convert Different Video Types to .MP4 Format for Playback?